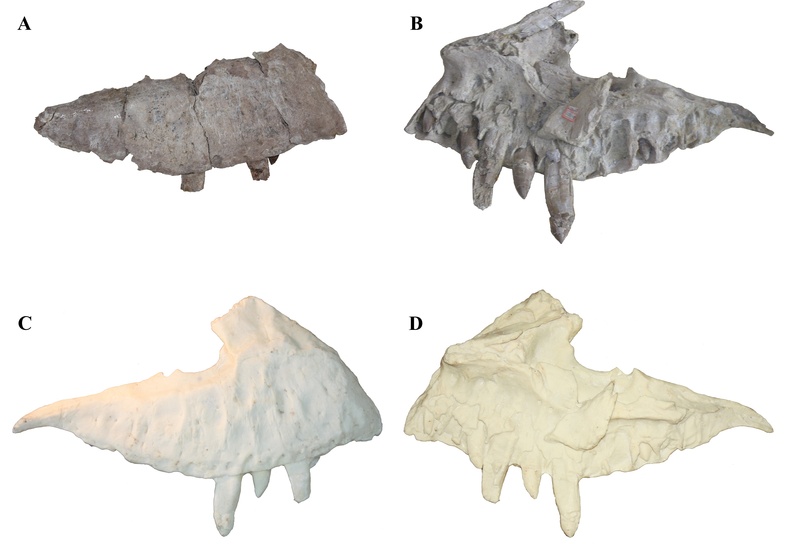 So, as probably everyone knows by now, I have a new paper out and this is the first dinosaur I have named (as a first author) so welcome please, Zhuchengtyrannus magnus. This is a very large tyrannosaurine theropod that is comparable in size to that legendary source of all dinosaur comparisons: Tyrannosaurus rex. Yep, Zhuchengtyrannus, (or ZT as I’ve been informally calling it) is a big guy with a skull over a metre in length, in the 10 metre range for total length and thus also probably around 6 tons or so. Obviously this is a big deal for me so there’s lots more to come on this over the next few posts and so don’t panic if this first introduction doesn’t give you all the details you were hoping for. Despite the apparent paucity of the available material (as will become clear) there is a lot that can be said about this and other things that are mentioned in the paper. First off is that name. Those who are long time readers will know I’m not at all fond of ‘place-name-saurus’ type names but some of us are born with bad names for dinosaurs, some achieve bad dinosaur names, and (in this case) some have bad names thrust upon them! 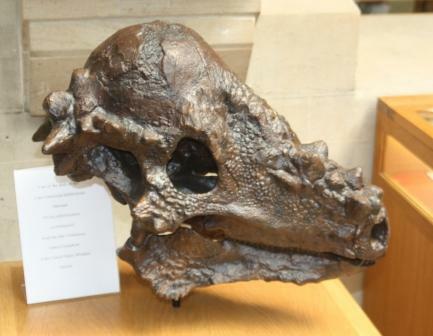 Anyway, if you’ve not guessed the genus name Zhuchengtyrannus simple means ‘tyrannosaur from Zhucheng’ and the species ‘magnus’ refers to the large size. 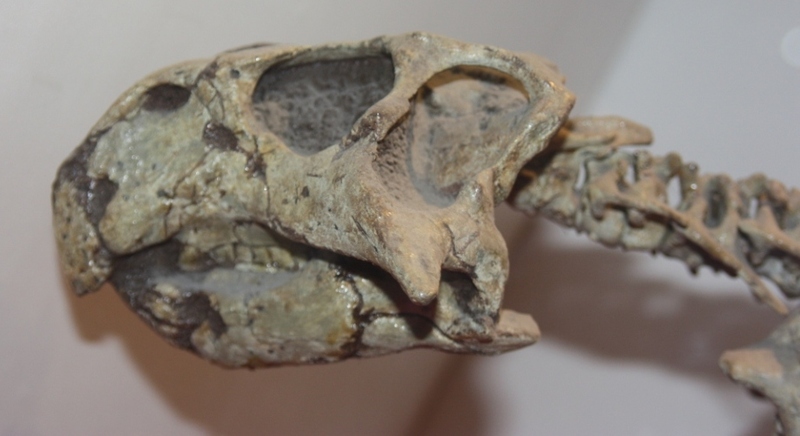 Zhucheng, if you don’t know, is a small town in eastern China and has recently achieved fame for the huge amount of dinosaur fossils that have been found there and this is the latest of a number of new taxa. It’s can be pronounced as either ‘Zoo-cheng-tie-rannus’, or with more of a ‘Joo’ for the first syllable. The latter being closer to the formal Chinese pronunciation of the name, the former a less formal anglicised one. On that note, while 2010 was celebrated as the year of ceratopsians by many, it should not be overlooked the huge number of tyrannosaurs that have cropped up in the last year or so. Teratophoneus, Raptorex, Xiongguanlong, Sinotyrannus, Bistahieversor and others have all come through recently which adds massively to the number of tyrannosaurs of various ranks in the literature. That’s quite an increase for a clade known from only about 15 species or so as little as 3 years ago and now you can rack up two more. Yes, two. 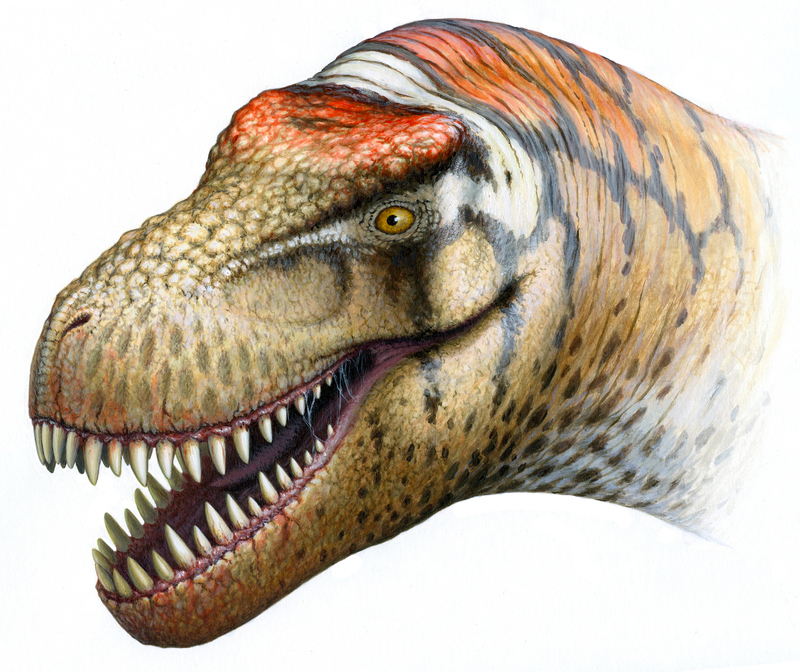 As for Zhuchengtyrannus itself, I’m a few paragraphs in and have yet to talk about the thing yet. 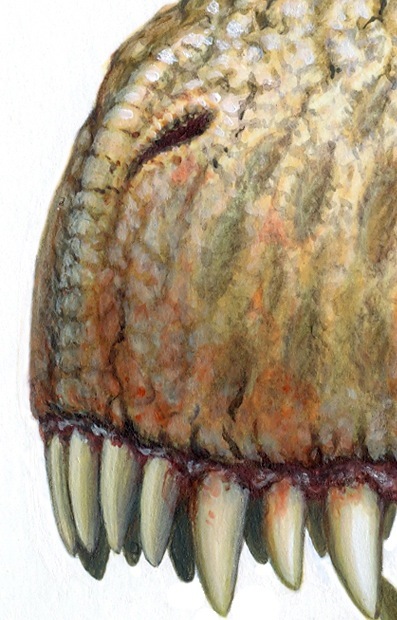 It is, sadly, represented by a less than complete specimen – we have a near complete maxilla (above) and a dentary (below), both with most of the teeth intact. The maxilla is one of the main bones of the face that makes up most of the side of the snout and holds most of the teeth for the upper jaws, while the dentary is the main part of the lower jaw that again, holds the teeth. That’s not much, but happily (as I’ll be covering in a later post) tyrannosaur maxillae are full of important taxonomic characters and as a result we are quite happy with this being diagnostic as a new genus and species. While that’s not much the material we do have is in great condition (well, more on that too). As noted it is a big one and comparisons to the maxillae and dentaries of other tyrannosaurs show that it’s bigger than anything out there except Tyrannosaurs and Tarbosaurus and it’s comparable in size to both of them. Obviously there’s just one specimen here and there are bigger specimens of Tyrannosaurs at least, but this is right in the mix. There’s nothing really odd or unusual about ZT so we it is ‘basically’ just another giant tyrannosaurine in the mould of these two more famous giants. But it’s not the only one. While we don’t describe it or figure it, we do mention in the paper that ZT is one of, what we think, are two new tyrannosaurs at the site. 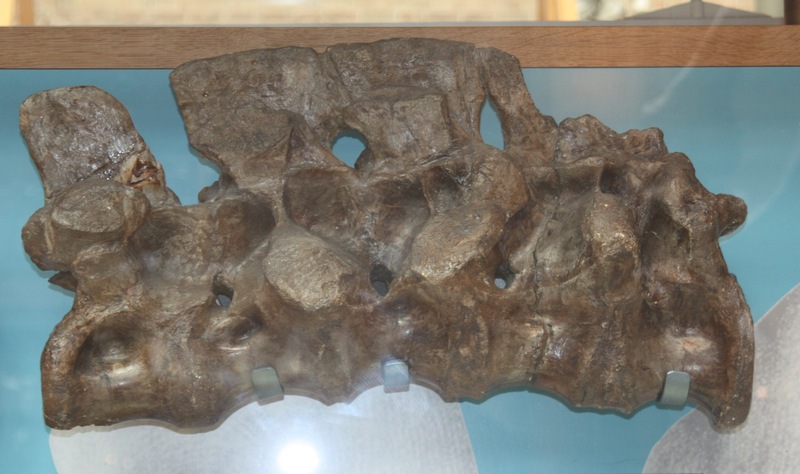 In addition to the elements of Zhuchengtyrannus, there are a variety of teeth and postcranial elements including vertebrae, femora and various metatarsals. Significantly there are also another maxilla and another dentary, neither of which match ZT or those of other tyrannosaurs meaning there are probably two taxa here. However, it also complicates that postscranial material – with these pieces being isolated and there being two genera present, it’s not possible to assign them to one or the other reliably at the moment. Thus there quite probably is a lot more of Zhuchengtyrannus already in our possession, but we can’t prove it, limiting us (for now) to just the skull pieces that were found together. Between these new taxa and others recently described Asia now seriously rivals north America in the tyrannosauroid diversity stakes. While that’s perhaps not a big surprise in the basal tyrannosauroid stakes which already had a strong Asian base and were not that big in the Americas, that the tyrannosaurids and tyrannosaurines are catching up in diversity is rather more notable. No longer is Tarbosaurus the only Cretaceous giant tyrannosaurine in Asia, so once more I must ask you to please welcome Zhuchnegtyrannus to the world and do come back, there’s lots more to say. Hone, D.W.E., Wang, K., Sullivan, C., Zhao, X., Chen, S., Li, D., Ji, S., Ji, Q. & Xu, X. 2011. 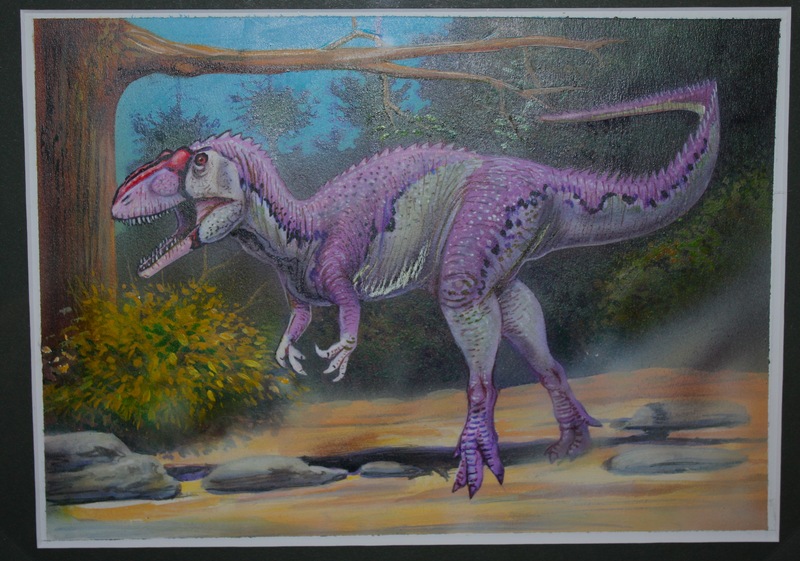 A new, large tyrannosaurine theropod from the Upper Cretaceous of China. Cretaceous Research, in press. And of course, my thanks to Bob Nicholls of Paleocreations for the magnificent artwork. And thanks to those bloggers who have held off on their own posts on this before I was ready, it’s very much appreciated. I should also make a final extra point that once again a journal has stuck up an uncorrected proof of a paper – I can see already that a rather critical part of one table has been cut off and there are a couple of errors that need fixing which is why I don’t like these things. If you know what this is or can guess, then please keep it to yourself. In order to avoid this happening again (or at least reduce the effects), we’re trying to keep this from the mainstream media till tomorrow. Sp please don’t blog or write about it just yet. If you don’t know, you can get a bit excited because all will be revealed very soon. Thanks for your help. There’s a bit more I wanted to say about the podcast from Science…Sort Of that I flagged up earlier. I was very much appreciative of the way the guys there handled the situation and sought to resolve it, and was an excellent demonstration of how science discussions should (but rarely do) work. This did get a garbled minute on the podcast, but is worth talking about further. As noted long ago, a decent and proper discussion can be really hard on the internet with vicious (and often inappropriate / wrong) comments from anonymous sources flying around in vast numbers. Even well meaning and well intended polite corrections and criticism can be overlooked or misinterpreted in the storm given the general tone of the surroundings. When everything is shrill and nasty, something that is not, but still negative in content, if not tone, might be seen to be worse than it is. It was then, with a little trepidation, that I left what was intended as a polite but firm rejoinder to their initial podcast (77) that left much to be desired with regards to pterosaurs and my paper. In hindsight, I could and should, have made it more polite and constructive. Mea culpa, lesson learned, and this does yes make me look a little (but not much, I hope) hypocritical. However, the guys there understood that the tone was intended to be friendly, took no offense, and mailed me back almost immediately to ask what they could have done better and how best to fix it. Brilliant! We could do with a little more of this I think and it’s great to see people respond in this way. It’d be nice to see a few more polite comments online in general, and in the literature too on occasion, but sadly hell remains hot and the pigs are grounded. A couple of weeks ago the scientific podcast that is Science…sort of ran a piece on this pterosaur paper of mine. Unfortunately, despite their normal sterling efforts, this wasn’t really an accurate representation of pterosaurs or our research. Happily though, they were receptive to me pointing this out and were kind enough to immediately invite me and Ross Elgin onto the show to talk pterosaurs. That podcast is now up and you can drop in at this link here to hear us pontificate about those lovely flying reptiles and our work on them. I’ve been rather too busy the last few days unfortunately so blogging has had to take a back seat. 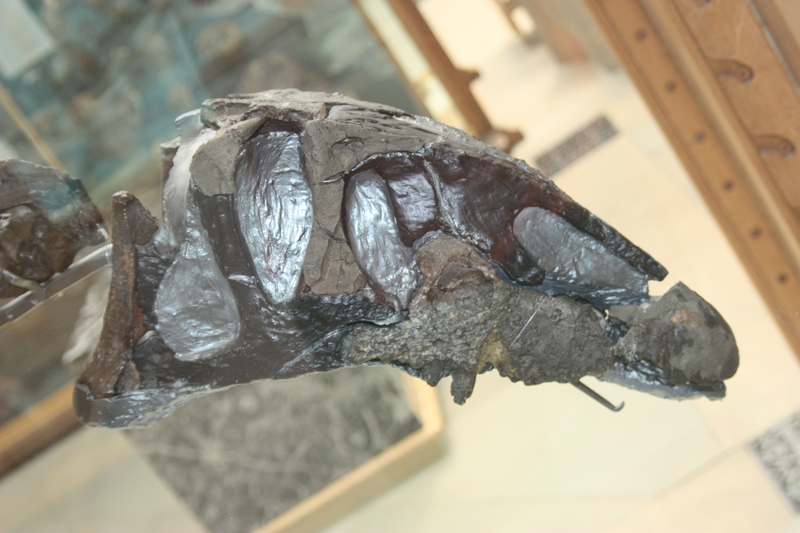 In the meantime, here’s some photos of a Pachycephalosaurus skull (well, a really nice cast). I’ve long intended to write something interesting about this but never came up with much and, well, here’s the pretty pictures at least. For those who don’t know I suppose I should at least mention the derivation of this name which basically translates at the “thick headed reptile”. That huge dome of bone is basically solid and pachycephalosaurs carried round quite a weight of bone in that head of theirs. In fact for most taxa, this is all we know of them – the domes, perhaps unsurprisingly, survive rather well but the rest of the skeletons are rather rare. 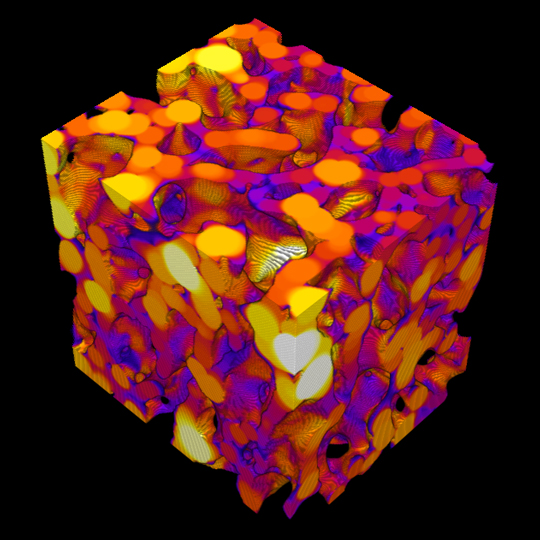 What can you do with a fragment? Having already talked about naming fragments a great many moons ago, it seemed about time I wrote a little more on this subject. Fossil archosaurs of course can be represented by complete articulated skeletons down to just parts of single bones or isolated teeth. As I have discussed before, obviously not of these are equally valuable, or equally valueless, but it might seem obvious that small bits are typically of little use. The key point here of course is just how diagnostic that ‘fragment’ is (and a fragment here can really be ¾s or more of a large bone). You can probably tell if that distal end of a femur is from a tyrannosaur and that means you must have tyrannosaurs (or for a real example, a pubis). When this might be the only evidence of an entire clade it’s obvious that this is important. It should therefore be of interest to realise just how diagnostic individual bones, or even parts of bones can be. Chevrons for example all look pretty much alike (or at least there is very significant overlap in morphology over very different taxa) so half of one of them really won’t tell you much, but even there at least some in hadrosaurs for example look rather different to those of theropods or sauropods and can be of some use. Ribs are understandably often of little use, but humeri or maxillae say can be identified to small clades or even species in some cases and so too can little bones like the astragalus and of course neomorphs like pteroids are great. That mean that while yeah, sure, there are some really rubbish fossils out there that are not really worth collecting, even small bits of small bones can be really important. You may not see much in them, but someone coming through the collection might well be in a position to say “Holy Cow! That can only be left tracularsplanknick bone from a derived pseudomadeupia and they don’t appear in the fossil record for another 50 million years!”. Fragments can be really important. So yesterday I muttered about how I mysteriously had a new found interest in the British Middle Jurassic theropod Eustreptospondylus. And here is the reason for that, a Luis Rey original of that self-same taxon. When I last visited him he was kind enough to give me one of his old ‘sketches’ (he considered this little more than a draft I think) for a book he’d been working on. As I understand it, this never got redone or published so this is, sort of, a first. Obviously I’m delighted with it and it’s now part of my ever growing collection of wildlife and palaeoart. Despite taking these photos quite some time ago, I’d never got round to covering this little British theropod but now I have a nice reason to do so which will follow tomorrow. 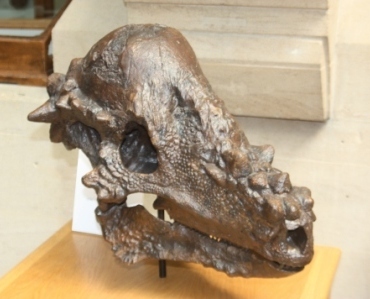 I freely admit I’m none too familiar with some of the more basal tetanurans since while they are pretty common in UK museums (Megalosaurus, Beklespinax and others) I’ve never spent much time looking at them or reading up on them. Thus while it was nice to see this fairly complete holotype (most of a skull, pelvis and hindlimbs and some other bits) I didn’t look at it in detail. If noting else I was simply trying to enjoy the museum – it can be hard to switch off sometimes. Hindsight is of course 20:20 and I now wish I had paid more attention and got some better photos now my interest has been heightened. And what heightened it? All will be revealed tomorrow. I was never *that* into dinosaurs as a kid – sure I had a few books and toys but I was generally more interested in mammals than anything else. My brother was generally nonplussed by the natural world and as a result I inherited some hand-me-downs which were among the better dinosaur things I had when young. One of these was a series of small, but rather well made, dinosaur models that sat on a bookcase shelf for many years. I recall quite clearly a black Pteranodon with a yellow front and a bight blue ankylosaur with evil, red eyes and a nice Dimetrodon. One of them had utterly slipped my mind till my nephews turned it up in a toy box this weekend. I remembered the toy quite clearly and it’s not really in any worse condition that I remember it from some 15 years ago (or more). The obvious question though is what is it? It looks like a rather gone wrong troodontid, with something of a hadrosaur-like appearance. Frankly, I had no idea and the odd blue and yellow colour scheme, coupled with the striations on the back that could be anything really. Turning it over it’s actually dated to 1972(!) and it declares itself to be a Saltoposuchus. Even in days when synapsids and pterosaurs were considered dinosaurs (OK, that’s true today as well, if less so, a bit…) that’s a bit of a left field entry to say the least. Even now it’s hard to get hold of prehistoric models of non-dinosaurs or obvious classics and I can’t help be pleasantly surprised that nearly 40 years ago someone thought to model this basal and little crocodylomoprh, regardless of what they thought it actually was. I’d be very surprised to learn if anyone else has ever produced a model of this little guy over the years and I’d be keen to learn more about this if anyone happens to know anything of them. You might think that by now I’d have done Dsugnaripterus to death given the number of times I’ve covered or mentioned this taxon. However there is one last think (at least for now) well worth mentioning, and that’s the shape of the skull in dorsal view.The vast majority of pterosaurs are preserved without a good skull, or one that’s only seen in lateral view, or is rather badly broken or crushed. There are few that are complete and in near perfect 3D but I’ve never shown them before at least. Here then is a pterosaur skull in dorsal view. Perhaps rather unsurprisingly, it’s more or less triangular with a long and tapering rostrum and a relatively squared off posterior end. While this might fit with your mental picture of the skull, it’s nice to actually see that it’s the case. Even so, the rostrum anterior to the nasoantorbital fenestra is rather narrower than you might expect and the bulges of the tooth roots seem to stick out a little to the sides which is interesting and you can see just how thin the midline saggital crest is. All good really. 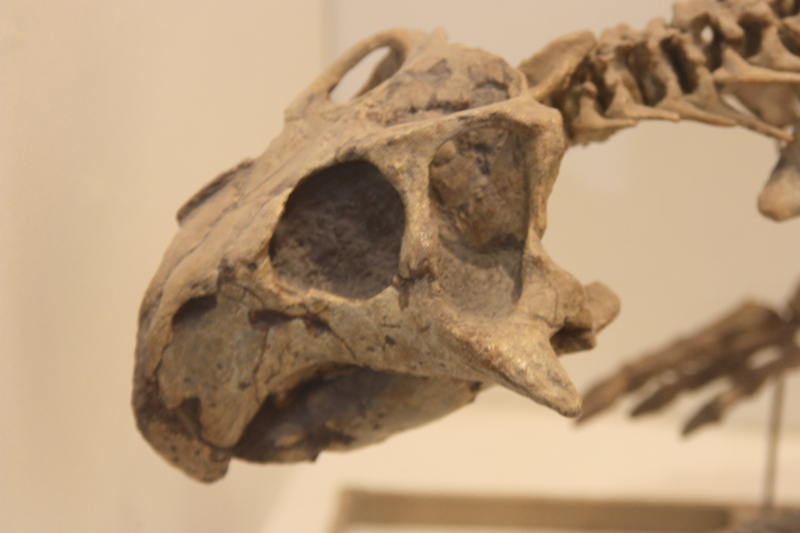 No, not a fashion designer (and one of the SS uniforms for that matter [exciting pub trivia]) but those delightful little cheek ‘horns’ that are seen on various ornithischians and especially the basal ceratopsians like Psittacosaurus shown here. 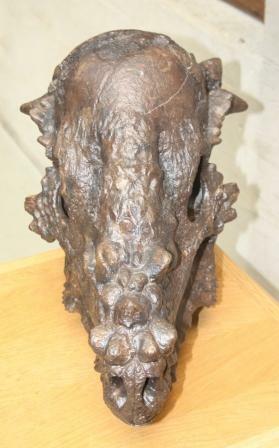 While many derived ceratopsids still have significant jugal bosses, their frills and horns mean that these tend to be overlooked by the casual observer as a small part of a greater series of ornaments and bizarre structures, but in the basal genera, where the frills were barely developed and horns not yet in evidence, they are the dominant feature. Naturally these play an important taxonomic role and are used in part in separating and identifying a number of Psittacosaurus species. This IVPP specimen has especially nice long ones thought foolishly I didn’t note down which species it was, thought it makes for a good example.